Home News 2016 Bow Wow Ball! Get Your Tickets NOW! 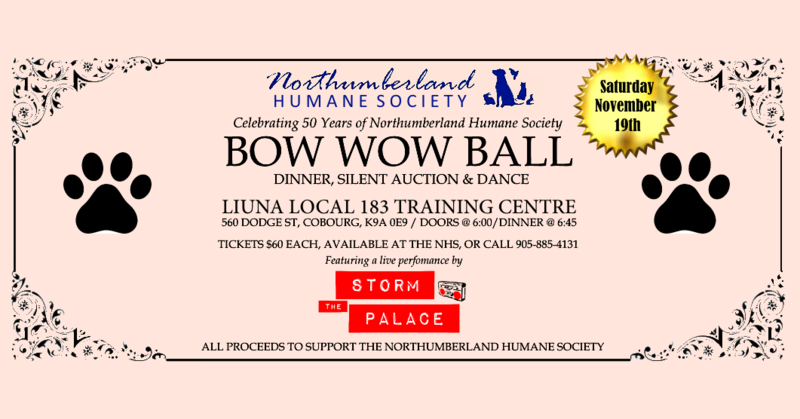 Storm The Palace is honoured to once again be asked to perform at the Bow Wow Ball in support of Northumberland Humane Society. Even if you have never required or benefited from the services provided by the Northumberland Humane Society, we can all take comfort knowing they are there, tirelessly working to protect and support the creatures who can’t speak up for themselves. Doing this work can be physically, mentally and emotionally exhausting. The workers put themselves at risk of injury from animals that don’t know they are being helped or abused verbally or physically by humans that are forgetting that the well being of the animal is why the Humane Society do what they do. And it costs money. Please, join us for a night out on November 19th at a unique venue in Cobourg, the Liuna Local 183 Training Centre on Dodge St. The food last year melted us from the insides it was so delectable! And the auction items are the kind of unique packages that will have you envious! I know its makes for an expensive night out, but please consider doing it for the animals and this essential organization in our community. Storm The Palace is proud to donate our time and effort to the Northumberland Humane Society.